The Rialto market is always open for shoppers. To the east is a neighborhood of small shops and restaurants; to the west is the Rialto farmers' market. 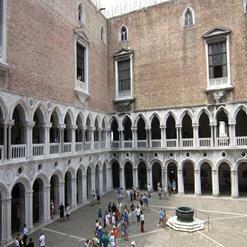 Shopping is slightly less expensive than in the tourist-filled Piazza San Marco. The bridge has become one of Venice's most recognizable icons and has a history that spans over 800 years. Today's Rialto Bridge was completed in 1591 and was used to replace a wooden bridge that collapsed in 1524.